The new Coastal Science & Policy Program has enrolled its first cohort of students for fall 2018. Clockwise from top left, they are: Shakera Arnold, Ross Davison, Dingxi Safari Fang, Celeshia Guy, Andre Joseph-Witzig, Mali’o Kodis, Samruddhi Kothari, Biraj Shrestha, David Torres, and Casey Zweig. Anne R. Kapuscinski, professor of environmental studies and incoming director of the Coastal Science & Policy program at UC Santa Cruz. A new graduate program in Coastal Science and Policy at UC Santa Cruz will welcome its first cohort of students in fall 2018. The interdisciplinary master's degree program will prepare students to design and implement solutions to the complex social, ecological, and technological problems facing the world's coastal ecosystems and communities. Building on UCSC's long-standing leadership in coastal science and in addressing real-world environmental challenges, the program is designed to teach students the practical skills, interdisciplinary knowledge, and innovative approaches needed to solve threats and realize emerging opportunities for coastal sustainability. Students completing the program will receive a Master of Science in Coastal Science and Policy. "Our program is distinctive for its focus on training emerging leaders to excel at developing and pursuing actionable sustainability solutions," said Anne R. Kapuscinski, professor of environmental studies and incoming director of the Coastal Science and Policy program. "Students will emerge from our interdisciplinary curriculum and immersion in real-world projects prepared to take on the coasts' greatest challenges and opportunities for sustainability." "We had an impressive and highly competitive group of applicants for the first cohort, and we're thrilled about the students chosen to inaugurate the program," said co-director Don Croll, professor of ecology and evolutionary biology. "The students we chose span a wide range of disciplinary and geographic diversity, reflecting the interdisciplinary nature of the Coastal Science and Policy program itself." Applicants for the program's inaugural class included prospective students from coastal regions in 28 countries around the world and from across the United States. Ten students representing seven countries were chosen from a pool of more than 100 applicants. They include Shakera Arnold from Belize City, Belize, who has worked for the past eight years as a marine reserve manager for the Belize Fisheries Department; David Torres, a forest engineer from Cuzco, Peru, who is working to reduce deforestation in key landscapes of his country; Ross Davison of Mountain View, California, who has headed conservation projects around the world and is currently using drone imagery to create high-resolution maps, models, and conservation materials for marsh ecosystems; and Casey Zweig, who currently leads environmental programs for the City of Malibu with a strong focus in coastal issues. More information about the inaugural class of Coastal Science and Policy students is available online. Kapuscinski comes to UC Santa Cruz from Dartmouth College, where she was a professor of sustainability science in the Environmental Studies Program. 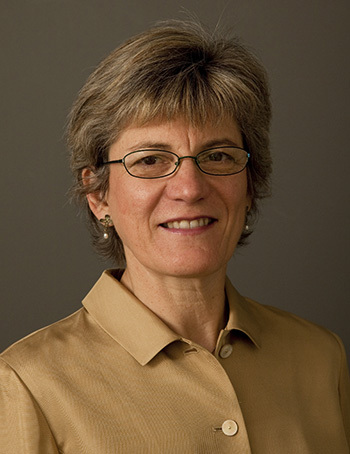 She is chair of the Board of Directors of the Union of Concerned Scientists and has served as scientific advisor to the U.S. Secretary of Agriculture, the World Health Organization, and other national and international agencies. She is the inaugural editor in chief of the sustainability transitions domain of the online journal Elementa: Science of the Anthropocene. Kapuscinski's research stresses a systems approach to sustainability challenges, integrating across ecological, social, and economic domains of the problem, with a current emphasis on shifting aquaculture to sustainability. Faculty with expertise in a broad range of fields in both the natural sciences and the social sciences have developed an integrated curriculum for the program, with intensive courses that are practical and project-based, in subjects ranging from statistics and coastal governance to facilitating change and decision analysis. A focus on developing solutions rather than describing problems will orient students to systematically identify problems and threats, explore potential solutions, and pursue feasible options. They will also work directly with partners outside the university to develop and implement practical solutions to real-world problems. An intensive internship during the first summer of the program will have students working with a faculty mentor and a mentor from a partner institution (which may be a private, government, or non-governmental organization) to identify and initiate a potential capstone project. Year two consists of an immersion with the partner institution to work on the project addressing a real sustainability issue. Second-year students also attend a seminar in which they share their issues and progress with faculty and fellow students. A successful fundraising effort has enabled the program to offer graduate fellowships covering tuition and living expenses to all students entering the program, which helps to ensure broad access. Major donors to the program include the David and Lucile Packard Foundation, the Helen and Will Webster Foundation, Wells Fargo Foundation, and anonymous donors.